Once imagined as mermaids and mermen by homesick sailors, manatees have had quite the history – especially in regards to their relationship with humans. It all began when their humanlike eyes enchanted sailors who caught brief glimpses of them floating in the water. And, although they were once a heavily populated species, extensive hunting during the 18th and 19th centuries and ongoing development in their habitat has severely impacted their population. Manatees are large, bulky mammals with flippers for forelimbs and a spatula-shaped tail. They can grow to be as large as 12 feet long, weigh up to 3500 pounds, and can live to be as old as 50. Vegetation makes up their sole food group, typically consuming at a rate of 100 pounds a day. These gentle creatures currently inhabit the waters of the Western Atlantic, from Florida to Brazil that are known for their love of warm waters; that’s why they seek refuge in natural warm water springs surrounding Florida. Unfortunately, this is also why many manatees get trapped in warm water outflow tunnels from power plants. 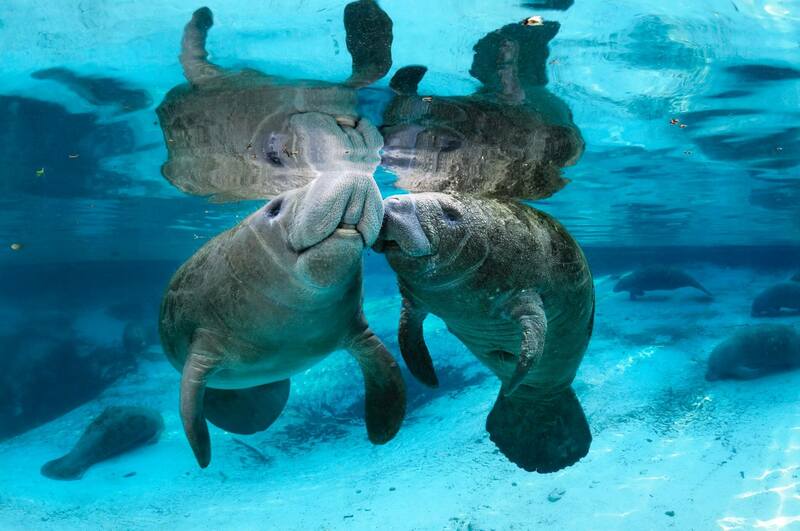 Luckily, there are foundations like the Florida Manatee Recovery Plan coordinated by the U.S. Fish and Wildlife Service that have created a plan of action to help them recover from their current endangered status. As part of this initiative, in 1989, Florida’s Governor and Cabinet directed the states wildlife agency to work with 13 key manatee counties to help reduce injury and death. Since then, these counties have been working with the state to develop site specific boat speed zones, to help reduce the likelihood of a boat crash and to implement comprehensive manatee protection plans. In addition to these programs, experts also believe that researching these gentle creature’s biology, mortality, population distribution, behavior and habitat is essential to understanding and saving them. But, with the continued implementation of management plans and enforcing speed limits in the outlined zones, it’s safe to say we’re on the right track to repairing their population and saving the majestic manatee from extinction.